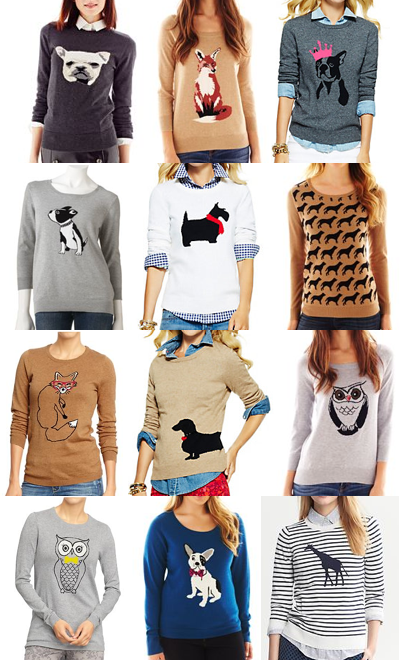 Animal sweaters are back this fall and I'm a big fan. I used a Labor Day coupon plus a $10 Gap credit card reward to get this cute dog version for $12. I talked about buying an ivory giraffe version from Banana in a past post, but ultimately decided to go for the lower price point since it's a trendy item. The quality of the Banana sweater is definitely better - this one is slightly sheer as you can see in the bottom photo - but overall I'm happy with the quality of this Old Navy sweater at this price. Will you be trying the animal sweater trend this fall? Also, I bought both of these shirts and keep going back and forth on which one to keep! By itself, I like the one on the right better, because it's a tailored fit. The left is a boxy boyfriend fit, but I like how it looks under a sweater, especially the cuffs. The one on the right has solid cuffs so the stripes don't show up on your sleeves (unless you do the fancy cuff pictured on the website). Which one would you keep?